Upper Deck announced the release of the Naxxramas Raid Deck and the Treasure Pack. Those who speculated the WoW TCG was dying can kiss UDE’s, they got more stuff coming! Upper Deck Releases Naxxramas Raid Deck and All-New Treasure Pack Naxxramas Treasure Pack is now available as a stand-alone product! Warcraft Manga and ScourgeWar TCG Sweepstakes! Our friends from TOKYOPOP informed me they have united with Upper Deck to launch a new contest with some sweet prizes. You better participate for a chance at getting any of the prizes. All you need to do is login into your Tokyopop account and click a button. That’s all. Among the prizes are an entire collection of the Warcraft Legends manga, World of Warcraft: Death Knight by Dan Jolley and ScourgeWar loot cards (including the Spectral Kitten pet). Check out the rules page here to enter. If you have problems, feel free to contact me. Update: Read the full rules to participate: Only natural persons who are legal residents of the 50 states of the United States and the District of Columbia and who are at least 13 years old at the time of entry are eligible. Identification must be produced on request. Employees of TOKYOPOP, its Sweepstakes sponsor (if any), advertising and promotional agencies, and their respective affiliates and associates and such employees’ immediate family members (spouse, parent, child, sibling and their respective spouses) and those living in the same household of each (whether related or not) are ineligible to participate. Only one entry per person. Multiple entries will be disqualified. If any entry requires the submission of any materials, such as photos or drawings, all such submissions become the property of TOKYOPOP and will not be returned..
Upper Deck Entertainment and TOKYOPOP Present The World of Warcraft Manga and Trading Card Game Just-Push-This-Button-It’s-That-Easy Contest! 2. Sign into your TOKYOPOP profile here. … and a copy of World of Warcraft: Death Knight. Are you an artist? Here’s a very nice opportunity to win prizes and why not, even a resume booster by participating and winning the Design Your Own World of Warcraft Trading Card Contest. Many of the artists who provided their talent to the artwork behind each TCG card have come from the Deviant Art community. Thus you have the same chance to win than any of those who got hired by Upper Deck. Just in time for the holidays comes the Design Your Own World of Warcraft Trading Card Contest! If you want to win some great loot from Upper Deck, all you have to do is download the Hero card frame on our contest page, design a cool piece of artwork to fit the top frame and provide a description text of your very own custom-made Trading Card Game Hero card! If your card is the best, you could find some epic loot under your tree! Be sure to check out our Terms and Conditions before entering. WoW TCG players, set your timers because the countdown has begun for the World of Warcraft TCG: Scourgewar Sneak Preview Events at various locations around the world through November 20-21. The Scourgewar Expansion will be officially at stores on November 24. Check out at the bottom of this page your location to find out where these events take place at. The prizes for the tournament winners are: Scourgewar Playmat, Series 2 Priest Class Deck Box, and a cool Kilix the Unraveler Extended Art Card. Blizzard Entertainment has announced the availability of the Mohawk Grenade, and to do so unveiled a new TV Commercial with Mr. T — who curiously is wearing a J!NX Murloc Taco T-Shirt. 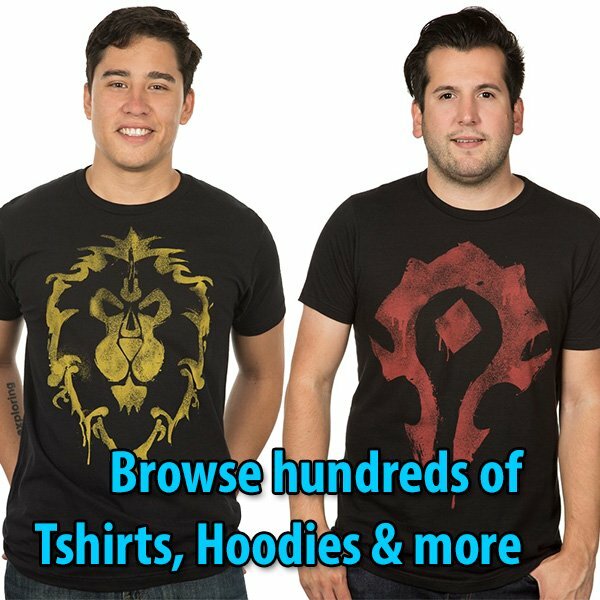 Upper Deck and J!NX to lure people to World of Warcraft? A picture in my mind shows Paul Sams smiling with a shiny gold tooth. Now that’s marketing strategy at its best. The Upper Deck Senior Director Scott Gaeta addressed fans at the official UDE forum to debunk rumors that the World of Warcraft Trading Card Game (WoW TCG) is nearing its impending demise after the ScourgeWar set (On sale November 22, 2009). The rumor caught momentum when the site claiming the demise said the buzz came from a reliable source. No wonder, the Senior Director emerged to squash the bugger. Gaeta revealed their team visited the Blizzard Entertainment offices in Irvine to discuss their 2011 plans for the WoW TCG, and as UDE informed a few weeks ago, they announced a schedule list for 2010. The WoW TCG license is stronger than ever and to stay. The past weeks UDE has thrown the house through the window with spectacular WoW TCG Tournaments. Precisely yesterday and today UDE held the 2009 Season 4 WoW TCG and Mini Realm Championship with up to $500,000 in prizes. Upper Deck&apos;s 2009 World of Warcraft® TCG and Miniatures World Championships Set for October 9­11 in Austin , Texas more than $300,000 in cash and prizes are at stake! North Las Vegas, NV (Sept. 18, 2009) – On Saturday and Sunday, Sept. 12 and 13, Upper Deck International hosted its World of Warcraft® Trading Card Game Darkmoon Faire in Amsterdam, and the result was the biggest Upper Deck World of Warcraft® Darkmoon Faire event ever! With more than 3,000 visitors gathering at the Westerpark Gasfactory, event organizers were ecstatic by the turnout. As curious onlookers approached the venue, you couldn&apos;t help but notice the demonstration queue spilling out onto the sidewalk, and Upper Deck&apos;s volunteer staff was kept busy all weekend long performing demonstrations for more 2,000 inquisitive visitors. Many of the new players stayed on to participate in the beginners&apos; tournaments using one of the free Starter Decks they each received. Visitors were also given an opportunity to expand their World of Warcraft® TCG collection by the on-site vendor, who accommodated consumers by taking orders after selling out of all event stock by noon on Saturday. A total of 21 different countries were represented by the 222 players who took part in the main World of Warcraft TCG tournament, while the online competition drew 12 times as many players as the usual number of Darkmoon Faire participants. The result was additional tournaments being added throughout the weekend to accommodate the high volume.